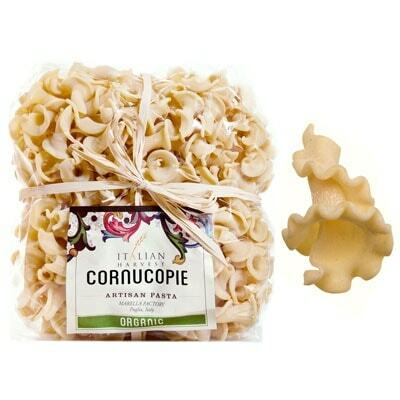 Lovely frilly conch shape pasta, this bag of cornucopie is from Puglian pasta maker Marella. Like all their other pasta shapes, these are organic and can be great for several kinds of pasta sauces. Sauces such as Pomodoro, Pesto, Ragu, Carbonara, or Aglio Olio with this pasta will bring you delicious primo meals. In addition, each pasta piece can trap any of the savory sauces in its frilly edges and hollow cones. Winner of the 2013 Silver sofi Award for “Outstanding Product Line”, Organic Marella pasta continue its tradition of creating excellent quality noodles. Try them out yourself today!